Doc Och's Box – Page 2 – Reinventing the wheel, so you don't have to. W7D2 I think I got a code in my node. I am doing what is called test driven development. You’ve heard of teaching to the test? This is coding to the test. You write the tests first; if I put this into the program, I should get this other thing out. Then you write the computer code that passes the test(s). So far, I have 274 tests (and code that passes 273 of them). It takes longer initially, but ultimately, you save a lot of time debugging. If I make a change in my code, then I can quickly run all the tests (it takes about 0.8 seconds) to make sure I didn’t break something else. When my code does break unexpectedly, as it did just before I stopped coding today (hence the 273), I can find the problem, add that input as a test, and be confident that it will not fail the same way again. It’s really hard to think up all the test cases ahead of time – you are looking for ways to break the code, so you add them as you go along. I am learning a new computer language, Python. It’s not nearly as hard as learning a new human language, which is why I don’t agree with replacing human languages with computer languages in school, as has been done or is under consideration in four states. Computer languages have many fewer words that human languages – typically around a hundred or so, but you only need a working vocabulary of about thirty to thirty-five to write even very complicated programs. The code I am writing is pretty complicated – it doesn’t break down into simpler tasks easily. In my case, each task affects the others, so it’s kind of tangly. Further, with a computer language, you are asking the computer to do a smaller set of things, and while there is code that you can look at and say “Gee, that’s beautiful code”, it’s not nearly as expressive as human language. There are never double entendres, for example, whereas I only ever write in double entendres. Get it? There are parallels between human and computer languages, though. One that has been slowing me down is idioms. Each time I code something new, I look up the Pythonic way of doing it – i.e. speaking like a native. In my head I know what I want to do, and can do it easily in a number of computer languages I know. However, learning the idioms helps produce code that is both more efficient and more robust. I’ve really been meaning to write about this whole “Google Manifesto” thing (on Fox News, they never use “manifesto” – it is the “anti-diversity memo”) . I’ve read it, twice. I’ve read most of the references as well, and a number of articles rebuffing it. I even listened to most of an interview between James Damore (who wrote the document) and Stefan Molyneux, a podcaster associated with the alt-right movement. I stopped listening because most of it was Molyneux trying to get Damore to agree with alt-right ideas, but Damore is a self-described centrist, so it didn’t really work. Although the tone it is written in is reasonable, the reasoning is not. Overall, he uses statistics from a general (worldwide) population to describe the women who work at Google (which is not a random sampling of women in the world), and even I could see holes in the paper he cited. If you are interested in a well reasoned and researched refutation of the memo, look here. A Girls Who Code spokesperson responded to the memo today. There’s a good video at the end of this article, which shows what women in tech experience regularly. This article has a good description of the current science around the topic of gender differences and the different issues women face compared to men. It is clear from his memo that Damore is not aware of the uneven playing field that women (and other minorities – heaven help you if you are a woman of color) face. I think, though, that Damore’s memo is a specific case of something much more pervasive, and something I think we’ll see much more of, especially during the next three and a half years, possibly longer. The general case is this: a privileged class of people (often, but not always white, middle class and mostly male) is not doing as well as they think they ought. They see oppressed classes getting a helping hand to level the playing field and think, “Hey, I made it here myself, and it’s not fair that they’re getting help I never got,” not seeing their own privilege. If you are in the privileged class, it is easy too look around and think everybody has the same playing field. You simply don’t see that other people have different experiences. I know this, because I used to think it. The video I mentioned above shows it perfectly. Once I became aware that this might not be true (via many discussions with Jennie, my daughter who has studied gender extensively), I held the idea in my head, and began to look for evidence. Slowly, I began to see it – I listened to the experiences of women (and others in non-dominant groups) around me – in tech and out, and it became clear that there really was an unlevel playing field. It’s why I do what I do, both with GWC and at school, and it has meaning for me. I use my privilege to give others a boost. There’s been some debate (if you ingest a wide enough swath of news) about whether Damore should’ve been fired. From the tone and content of the memo itself, maybe, maybe not. From the implications of the memo, it simply doesn’t make sense to keep him around, even for political spectrum diversity (which was part of his stated goal). It’s hard to imagine how someone who thinks the people (and so many of them) around him are inferior in some unfixable way (i.e. biological) can be a team player. There’s going to be a lot of resentment on that team, from both sides. And teamwork is where things are in the tech industry today. Gone are the days of the lone coder genius sitting in a semi darkened room (a la 1980’s movies – apparently that’s when women stopped coding) (thanks to Katie T. for the reference to the NYT article on loner nerds – “I don’t know what made her send it to me,” he says as he codes in a semidarkened room). I don’t know if I’ll write tomorrow – I have a friend (JKL) visiting, after which I’m going to see The Great Comet of 1812. I splurged and got a seat on the stage, over in the pit on the left of this picture, but I won’t be home until late. W7D0 You are not as smart as you think. But the Smart Car is really good at zooming in and out. It is excellent for parking enforcement because it can do a U-ey (I had to look up how to spell that) on an avenue, and can fit into tight spaces, so it doesn’t have to double park to issue tickets. That being said, I do not have full confidence in them. I was walking home from the train the other day, and there was one responding to an emergency (even using its Rumbler siren). It zoomed (because that’s what they do) around a corner, weaved through some traffic (they are really good at that), and was on its way. All I could think was, “Where are you going little car? What do you think you will do when you get there? Don’t you think you should wait for some of the big cars?” I feared for its safety. I saw it today, though, safely parked behind the police station. I had planned to write something about the “Google manifesto”. Not surprisingly, it’s making waves in the circles I am traveling with these days. I’ve read the document closely, including most of the references. I am going through it one more time and still have to double check some of the references. I think this is part of a larger cultural thing that is happening, and is related to the White Supremacy protest in Charlottesville, the recent presidential election, and to some things that have been going on in Europe around the refugees there. I still have more work to do, including re-finding where I got my working hypothesis. That’ll be the hard part. The tenor of at least one week 6 classroom has changed dramatically, I’m sure the others have, too – it’s go time. Technically, the substantial portion of their projects is supposed to be done tomorrow afternoon. Monday is testing and Tuesday lunch is code freeze – no more development after that. In reality, very little testing will get done on most projects – they’ll still be working hard just to finish. And I do mean hard. When I got to the room this afternoon, the girls had just come back from a panel with women senior technical workers, and rather than the usual ten minutes of chatting, going to the bathroom, getting a drink and so on, they sat right down, put their earbuds in, and got to work. The groups are in drastically different places. One group has essentially finished their project, and are working on additional features. Another group had an idea that was too big (they resisted suggestions to pare it down), they weren’t able to make the progress they hoped for, and they are in a bind right now. There is still a way forward for them, but their site will be static, rather than as interactive as they’d hoped. It’ll be more of a storyboard than an actual working site. W6D3 It’s got a nice ring to it. The honest truth is that I had already decided, the moment I stepped out of the yoga studio door, not to write tonight. I was tired, faced a mile walk home, and had (have) some other things that must be done before I conk out tonight. To tell the truth, I’m a little yoga drunk right at the moment. Caveat lector. I tried to find an internet reference to “yoga drunk”, but only found references about doing yoga while drunk, which is most assuredly not the same thing. My version of yoga drunk is that state of near total relaxation induced by a challenging yoga practice, the kind that pushes you to the edge of your comfort, and then just a smidge beyond that. That’s what the breathing is for – to help maintain your focus when you are uncomfortable. It’s not about stretching or poses or flexibility, though those come along for the ride. Ultimately, it is about breathing and focusing on your breath. So there I was walking home. I passed a woman who climbed the three steps into her apartment building and I thought, “Man, that seems like a lot of effort.” About ten paces later, I realized I had 187 steps and a half mile between me and bed. Even before that, though,I knew I was going to write tonight. I had been thinking about what to write all day, but nothing came to mind; hence my decision not to write as I came out of the studio – to come up with a topic and write it seemed like too much. But then, as I wandered toward home in my sozzled state (drunk has a lot of synonyms), I reflected on my day, and thought, “How can I not write about Joe-dy”? Although I spend only a couple of hours per week in each classroom, in most classrooms there is one or two girls that I have a notable connection with. I one classroom, it’s Sophia, who asked me to adopt her as my daughter about 15 minutes into the first class I visited, right after an ice breaker I failed miserably at. She seemed like a fun kid, so I said yes, so long as I didn’t have to pay college tuition. Now when I go to that class, I get a cheery “Hi, Dad!” and I answer back, “Hi Sophia! How’s it going?”, and we catch up for about 20 seconds, and she heads off back to whatever activity I walked in on. Though I didn’t know Judy’s name until today, she accepted me into her classroom a little over a week and a half ago. It’s one of those indelible moments. We had just boarded the 7 train on our way back from a field trip to Google, and she put her hand out and gave me “the Italian hand gesture”, which is an inside joke in that class. (“The Italian hand gesture, as it is known in that class (they use that term in many of their coding projects, as in “ x = ‘the Italian hand gesture’ ”), is putting your 5 finger tips together pointing upward and moving your hand slightly upward. I didn’t recognize it at first, so I made my hand into a beak and pecked hers. She simply said, “No. Like this.” and made the movement again. I was in. Today, I was working on attendance in that classroom, when I heard my name, “Joe!”. The girls call me a whole bunch of different things (Joe, Doc Och, Mr. Ochterski, Doctor Mister Ochterski, Doctor Mister Joe (if they call me “Mister”, I insist on “Doctor Mister”), but mostly Joe, because that’s how the teaching teams refer to me. I looked up, and three girls, Judy in the middle, were waving frantically for me to come over and help with their programming problem. There were six other teachers in the room, and those girls wanted me to help them. That’s a nice feeling. Later in the day, we were discussing some recipe they saw on the internet, I think it was this: “Smoked Bacon-Wrapped Onion Rings with Avocado Lime Sauce”. I offered an alternative: mix crumbled bacon into the onion ring batter mix, dip them, fry them, and serve them with guacamole. The idea was an immediate hit at that table. Judy said we should go into business together, and that we should call it “Joe-dy”. I think we’ll be hitting the fair circuit this year. I bet we’ll outsell the Bloomin’ Onion people. It’s moments like these that make the small stresses that come with this job so worthwhile. The girls are bright, energetic, fun and most of all playful, and that is a great thing to be part of. I had a convoluted way of picking music tonight. I don’t always listen to music when I write, but sometimes I do. I read that Gen Campbell passed away. His music was a huge part of my growing up. One of my favorite songs is “Gentle on My Mind”, which Alison Krauss (the voice of the angel in my head) covered on an album earlier this year, so I started listening to that album. Then I thought, “Hey, there was so much other music, too. I’d like to hear that.” In the time it took Alison to sing her song, I acquired the 2008 Glen Campbell: Greatest Hits. Now I’m singing “Like a Rhinestone Cowboy” like a rhinestone cowboy. Instant gratification is, well, so gratifying. I stayed after work in one of the classrooms today to support my teaching team through an unusual occurrence: a parent asked to speak to them after class. We had no idea why. I gave a heads up to my manager, who said the team had no obligation to meet with the parent. I offered to cover it for them, but they wanted to be there. The TA who met the parent at security and brought her up texted us “Bad vibes” before they even got into the elevator. Awesome. When they came into the room, it wasn’t so bad. I greeted the parent and introduced myself as the site lead. She started by praising the program and saying how much she appreciated everything we had taught her daughter, Amy (not her real name). Amy felt singled out when a member of the staff suggested she stay home if she wasn’t feeling well. The staff member explained that she meant stay home and rest. A misinterpretation, not too serious, and easily corrected. She said her daughter was bullied by another girl in the class. If true, that’s pretty serious. Somehow, the conversation progressed to the third point for a while before I brought it back around to this one. I asked the student to describe the bullying incident. I redirected back to that question a couple of times before I was able to discern what happened. It seems as though another girl did not respond nicely to a request for help. The mom suggested that maybe the girls’ personalities were like oil and water. We were able to address that by keeping the girls in separate groups for the rest of the summer. This is not such a difficult thing to do, since the girls will be in their final project groups beginning Monday, and aside from that one, there will be group work only a few times between now and then. Without casting aspersions on any particular style of education, I should point out that the style Amy experienced seems to have left her without much experience in working in groups, and further, not a lot of experience working with other teenage girls. The upshot is that she struggles with the give and take of group work. (“There’s been a load of compromisin’/on the road to my horizon.” Guess what I’m listening to?) She is making progress, but it’s in fits and starts. So yes, even though we sometimes disparage 21st century skills, collaboration and communication are important. The mom explained that Amy is an artist (she has works shown as part of exhibitions at MoMA), and that she is very creative and her ideas are fully fleshed out. I’ve seen this. It’s true. Unfortunately, I think that at least some, and by peer pressure even more, girls will reject her ideas not on their merit, but more based on their past experience of Amy. So what do we do about it? If her idea is not selected for a final project, she can still work on her idea on her own time (class time is for the final project), but the teaching staff can help if she gets stuck or needs resources. I suggested that she might, perhaps, be able to incorporate her ideas into a final project, using the phrase “I really like your idea, can we also add this…” Both Amy and her mom were concerned that Amy would spend a lot of time developing her idea, but it would never get attached to the final project (“no button for it”). We said we’d make sure that didn’t happen. After the meeting, we came up with a way for the girls to vote on ideas for final projects based more on merit than who came up with them. The girls are going to write a summary of each of two of their favorite project ideas, 140 characters max (the size of a tweet). This way, only outlines of fully fledged ideas get in, and it’ll be harder for the girls to discern who wrote them. Security through obscurity. The teaching staff is going to print and mount the forty (anonymous) ideas around the room and each girl will get 5 votes (colorful smiley face stickers; I just got them – way more fun than stars) on the projects they like the most. The staff will take the top six or seven, then the girls will rank the top three they want to work on. Then the staff will give the girls the highest ranked choices that can, making sure to keep oil away from water. In retrospect, I’m pretty sure that if I wasn’t there, the mother might’ve hit the teaching staff with both barrels. There are advantages to being an old white guy. In some ways this past weekend, with John’s wake and funeral, was a tough one. Still, the presence of my friends and family eased my burden and brought me comfort. When I came back to NYC yesterday, the weather seemed to be a metaphor for my return to the city. Although it was 77 degrees and had all the hallmarks of a beautiful day, somehow the breeze felt cold and biting. I’ve been working to accustom myself to the city’s summer heat, eschewing air conditioning when I have control of it, walking instead of taking the subway (though often the subway stations are the hottest places around), and generally accepting the heat. So, after sitting in the chill of the air conditioned train for a couple hours, I looked forward to hopping off at 125th Street into the warm city air. Though the sky was blue and the sun should’ve warmed the streets and the air above them, I felt a nip as I stepped off the train and the breeze seemed to slice right into my clothing. It felt more like late September than early August. I awoke this morning and realized for the first time in a long time that I had slept uninterrupted through the night. I checked the weather and saw that it was going to rain all day, although the thought of that didn’t seem to faze me. I hadn’t yet planned my day – which sites to visit or how long to stay. It is week 6 in some classes – the week the girls start designing and developing their final projects, but week 5 in others, where the girls will be learning about data science (extracting knowledge and information from data) and advanced algorithms. I knew I was going to go to a week 5 class – that’s where the direct instruction is still going on. Since the beginning of the summer, I have been encouraging the teaching assistants to take leadership roles in the classroom, perhaps leading a lesson or part of a lesson. The TAs are all very good in supporting roles, jumping in where necessary to help explain a topic and helping when one on one aid is needed during coding activities. A few TAs have gone well beyond this, and in one or two classrooms, the TAs plan and teach nearly everyday. I figured that this week is my last chance to see the other TAs give it a try. That cemented my decision. There was one classroom where, due to speakers and field trips, I hadn’t physically been present when anybody was teaching the GWC curriculum. That’s where I headed. There is a TA in the program who is using this position to count as an internship. I’ll refer to her as Ellen. A couple of weeks ago, she asked me to fill out a midsummer evaluation. She’s been doing a great job, and has met the relatively modest goals of the internship. The last question on the survey asked what changes I’d like to see. I said that I’d like to see her take on some leadership roles in the classroom. This is above and beyond what the goals were, but is something I’d like every TA to take away from the summer. GWC is really an excellent place to develop leadership because we celebrate mistakes (we all make them), there are many levels to leadership which they can try, and there is a lot of good support. The cost of failure is small, and the potential wins are big, and isn’t that the best environment for learning? When I got to her classroom this morning, the two head instructors in the classroom were team teaching about data science, and doing a great job. They introduced an activity to the girls, set the timer for 30 minutes, and the girls got to work. After they finished, I was pleasantly surprised to see Ellen get up to lead the wrap up of the lesson. For about 20 minutes she lead the girls in a discussion of the activity (building a Venn diagrams on the terms data frame, dictionary, and list, which all have particular meanings in computer science). She collected information from a wide range of girls, held them accountable, summarized the lesson well, checked for understanding, and was upbeat and positive through the whole thing. She had clearly prepared well. While the girls had been working on the activity, one of the instructors asked all four TAs if they’d be willing to show the girls some code samples of each of those three terms. None of the other TAs volunteered to step up to the plate, so Ellen took this part too, but this time without the luxury of time to prepare. Again, she did very well, though she met with an additional challenge. At one point, she was talking about dictionaries, and and referred to one called “my_dict”. Only when she pronounced it, she did not clearly enunciate the “t” at the end. Imagine saying that in front of a room of 40 teen aged girls. English is not her first language, so she wasn’t immediately aware of what she had said. The girls were. A wave of laughter began to spread across the room. She didn’t understand why, so one of the instructors explained that she had just referred to a part of male anatomy. When she understood it, she smiled, turned red, and then, to her credit, laughed a hearty laugh right along with the girls. She handled it perfectly – after that she just said “my dictionary”. Afterwards, I pulled her aside and asked if she had read my midsummer evaluation, because she had just done exactly what I hoped she would do more of. Nope. She can’t see her evaluation. She just did it. I told her what a great job she had done and that I’d be writing an excellent evaluation for her at the end of the summer. The GWC program is all about building courage and resilience, and she hit the ball right out of the park. I wandered through the rain over to another site later in the afternoon. They were just finishing up an activity spotlighting women data scientists, and had a few minutes before the end of the day. It wasn’t enough time to start the next lesson, so they decided to let the girls ask questions about college. Most of the questions were about how to choose schools. However, one girl, Naisha (not her real name), asked if colleges look at just your GPA, or if they also consider your progress. It turns out that she has one failing grade, in Geometry, from her freshman year. She is a rising junior, and is very concerned about getting into the college of her choice. She stayed after for a few minutes, so we actually got to have a conversation. “Her” top choice college is the same one that dad and older sister went to. She feels pressure (quite a lot) to go there too. It has a good business program which she is interested in. Still, she is worried about her GPA and that particular grade. I suggested to her that she was more than just those two numbers. I don’t know that she’ll take it to heart, maybe over time. English is her favorite subject and she likes to write. Fortunately, she is taking AP Language this year, so I suggested that if she did well, she could demonstrate that she is good at communications. I also suggested ways that she could become “the girl they remember”, the one that stands out above the others, not because of her grades, but because of other things. Participating in Girls Who Code is one of those things, but I also suggested touring the campus and talking to admissions officers (“You can do that?” “Yep.”) and making sure to go to the information session at her school when the college rep is there, and asking questions and getting to know the rep. I suggested she might write handwritten thank you notes to any interviewers she has. Most of this seemed to take her by surprise. I’m not sure how well some of what I said will stick, but I’m pretty sure I got her to think another way about how to approach college. She is so much more than those numbers. I was really glad I was in the right place, at the right time. Even though it was seven or eight degrees cooler today, the sun was lost behind a gray blanket of clouds, and I found myself walking in the rain everywhere I went, somehow the weather seemed so much better today than it did yesterday. W5D4 Ready or not, here I come. OK, I count five things to write about tonight. Still, I’d like to get to bed early, so I’ll try to keep them short. 1. Sadness – Wow, man, grief strikes you without warning. I know exactly when it happened. I was riding the 4 train to Grand Central and had a seat, which is kind of rare on the 4 because it is generally packed. I don’t read standing up, it’s too awkward with my backpack, and hard to read with one hand because the other is holding on for dear life. Those tracks are not smooth. I am reading “Boys in the Boat”, which was really well written by Daniel James Brown. I got to this passage: “Their white blades flashed above the water like the wings of seabirds flying in formation.” Even twelve hours later my eyes still well up. Some of my readers may not know that the principal of my school, John Fidler, passed away unexpectedly last weekend. It is the grief over his passing that hit me this morning. I got off the train a short time later at Grand Central in a daze. I stood on the platform, my back to a wall, facing its length. I just stood and slowly put my backpack on, looking at each and every face that passed me as people rushed to board the train. The station seemed twice as busy as usual – there were faces everywhere. Not everyone made it aboard that train before it left the station – that’s how busy it was. I slowly walked the length of the platform and climbed the stairs, still looking at every face I could see. It was as if the city was moving twice as fast as me. The usually distinct squeals and clacks of the trains, the loud muffled orders from the speakers, and chitter of conversations blurred together in one static cacophony. I stopped to pick up a bagel and coffee, and walked slowly toward the exit. Ever so slowly. I knew I wasn’t ready to face Lexington Avenue. I found a place to set my coffee, and stood and slowly ate my bagel, waited for my coffee to cool, and eventually drank it. I had no sense of the passage of time. When I looked at my phone later, I realized it must’ve taken me over half an hour to leave the station. I continued to slowly walk down 42nd street, semi-aware of my surroundings. There was part of me taking care, though, reminding me to look both ways before I crossed the street, keeping me from bumping into people. I just kept looking at faces. I can still recall many of them distinctly. In a few minutes, I was in the classroom, where students had already started on their activity for the day – a challenging coding tutorial. I joined in, helping girls get unstuck. Playing with teens will bring you into the present like nothing else. 2. Counterfeit drugs – I saw a cool guest speaker, Neil Campbell from Pfizer, who talked about a technology they are developing so you can use your cellphone to identify counterfeit drugs. He said about 80 percent of the drugs purchased online (from non-mainstream vendors) were counterfeit. You’d like to know if your medicine is real, right? The counterfeiters make really convincing copies, but they don’t have the same active ingredients, and may contain dangerous substances. (What do they care? They already have your money.) The new technology can spot minute differences in what the pills look like, and is 99.99 percent accurate. They are trying to get it to 99.9999999 percent accurate, and should be there soon. His advice? If a deal looks too good to be true, it is. 3. Bagelling – there are many slang definitions of this word, but the one I learned today is: “inserting a Jewish phrase or concept into a conversation in order to determine whether the other person is or isn’t Jewish.” (link) Didn’t know that was a thing, did you? Me either. One of the GWC instructors, who is Jewish, was making polite conversation with a representative at a vendor table, and said that she was from Arizona. The vendor, who did not appear to be Jewish, said, “Arizona, they have nice [insert Jewish word I don’t know here] there,” thereby revealing their common heritage. 4. Bolivian food – By the afternoon, I was feeling happy and full of energy (yay, grief, you are so transient). After I left my last site, I walked down a different than usual street toward the 1 train. I missed 7th avenue, and had walked all the way to 8th and 54th. I had a choice – walk down to my usual stop at 50th, or walk up to 59th, Columbus Circle. I got out of work a bit earlier than usual and had some extra time. I decided to try to find something for dinner, rather than waiting until I got back to the Bronx, and headed up toward 59th to try my luck. There are many restaurants along the way on 8th avenue, and I thought one of them might offer something different for dinner. Nothing caught my eye, though. When I got to 58th and 8th, I was surprised to see a subway entrance – I had expected to have to walk over to Broadway and 59th. I forgot that Broadway cuts diagonally west as it goes uptown, so I was actually pretty close to it. I resigned myself to having to get dinner in the Bronx, and headed down the stairs. I noticed something different immediately. At the bottom of the stairs, there were double glass doors, like the kind you find in the entrances to public buildings. Very few subway stations have these, and if they do, they’re usually at street level, not at the bottom of the stairs. I got down there, went through the doors, and low and behold (which translates from Middle English as “look and see”), a food court, with specialty fast food restaurants. Not as cool as Gotham West, but still pretty good, and definitely well situated. It was actually Turnstyle, a whole underground marketplace. With a plethora of unique choices, one stood out. I needed something that would transport well and reheat easily later. That excluded things like pizza (doesn’t travel easily, unless you tip it vertically, then it doesn’t travel well) and bento boxes (hot and cold in the same plate – doesn’t reheat easily). 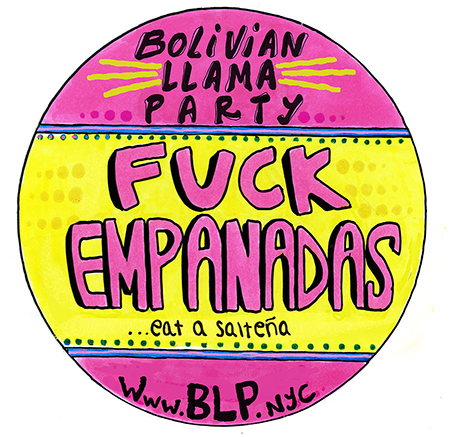 The winner was Bolivian Llama Party. I didn’t actually look a the name until after I purchased my dinner, but it was a good choice. There is a limited number of Bolivian restaurants in NYC (maybe 3? ), but it is good food. I had two salteñas, which BLP emphatically (NSFW) proclaims are not empanadas. They are like very happy and slightly spicy pot pies. 5. Hiatus – Doc Och’s Box will be going on hiatus for a couple of days while I travel back home to attend services for John. I’ll be back next week. The title today is a reference to this ditty from 1973: (Ready or not, here I come). Can you guess why? It’s a double entendre.